A keyword strategy serves as the original base for any Search Engine Optimization (SEO) campaign to launch from. These blind spots can lead to the loss of quality traffic and conversions because of how poorly they align with the intended audience’s online search behavior. Before creating a new keyword strategy, make sure to avoid these three common mistakes. Ever hear of Google Keyword Planner? Chances are, yes. Most marketers and SEOs tend to rely upon Google Keyword Planner exclusively, despite the fact that this singular tool only offers keyword suggestions and estimated monthly search volumes. In order to understand how particular keywords are affected by offline variables or how consumers use these terms when searching on their desktop vs. using their mobile devices, SEO strategists need to incorporate more tools into your strategy. Allows SEO strategists to understand what specific words or phrases online consumers use the most within every major search engine including YouTube and Wikipedia. If have two key terms that similar in nature and are struggling to decide which should be used a primary keyword, Soovle can demonstrate which term is more predominantly used by online consumers. Soovle is also helpful when trying to understand what other key terms or information should be used when creating content, as it populates terms that are often used by online consumers in conjunction with others. 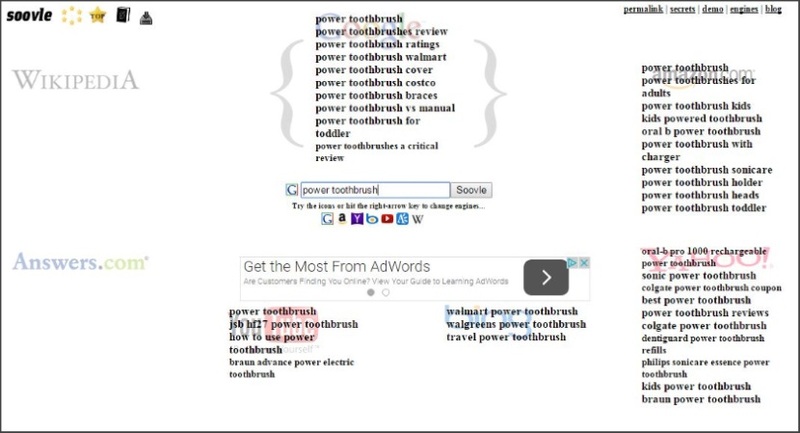 Based on how often theses references are searched for within Google, Bing, Amazon, and Yahoo. This free platform allows SEO strategists to compare keyterms and phrases that are similar in nature, but are referred to differently. 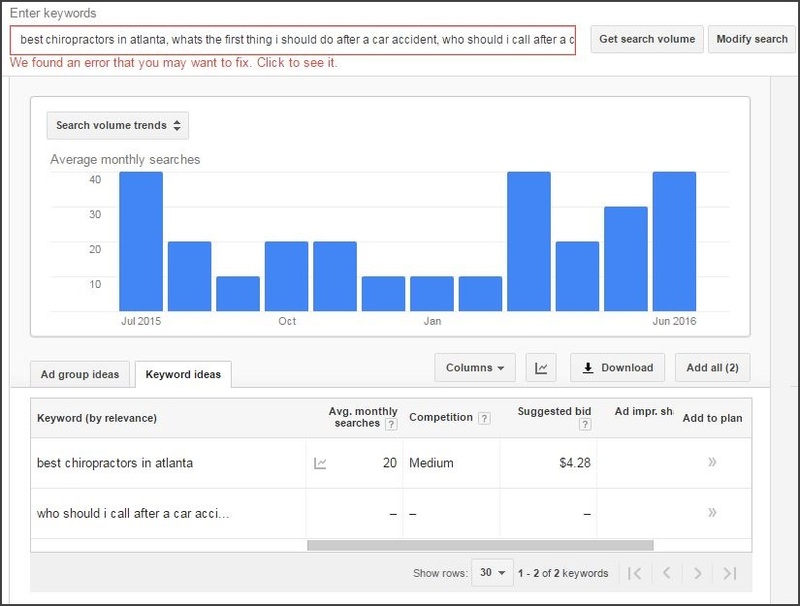 Instead of displaying information that highlights monthly search volume, Google Trends populates information around consumer resonation as it pertains to seasonality, geographical location, and date. 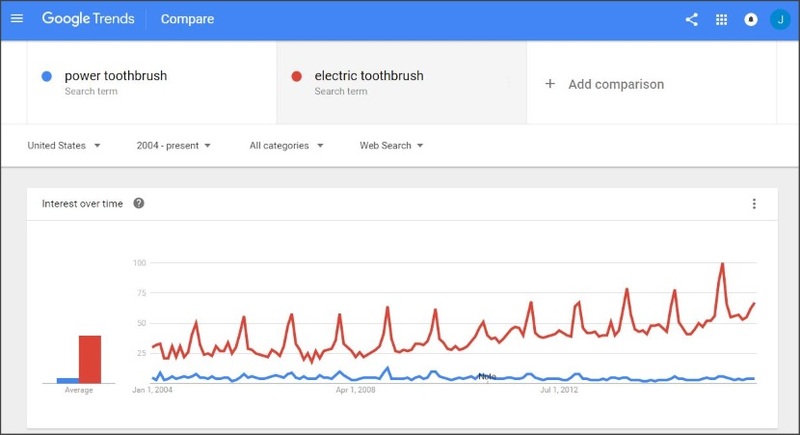 Using the example of “power toothbrush” vs. “electric toothbrush,” Google Trends demonstrates that the form “electric” aligns more with consumer resonation and has so since 2004. 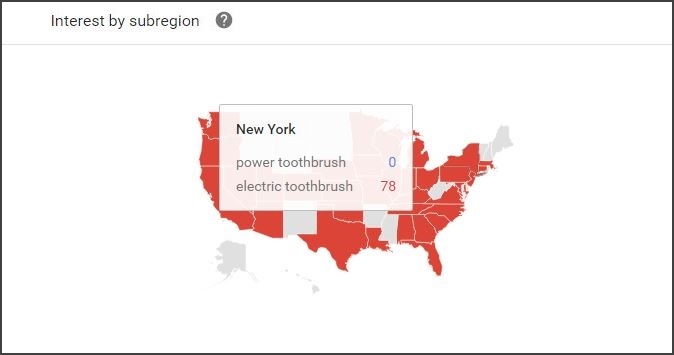 If a particular business or brand is interested in marketing their products within specific locations or communities, Google Trends can highlight what states and regions think of such products top of mind. Just because Google doesn’t show search volume around phrases, does that mean consumers aren’t using complete sentences when searching? No! If someone is optimizing a Chiropractic clinic’s website in Atlanta and wants to attract consumers who have been in a car accident, it would be reasonable to believe that such potential patients search for the best place to immediately go in order to receive medical treatment. 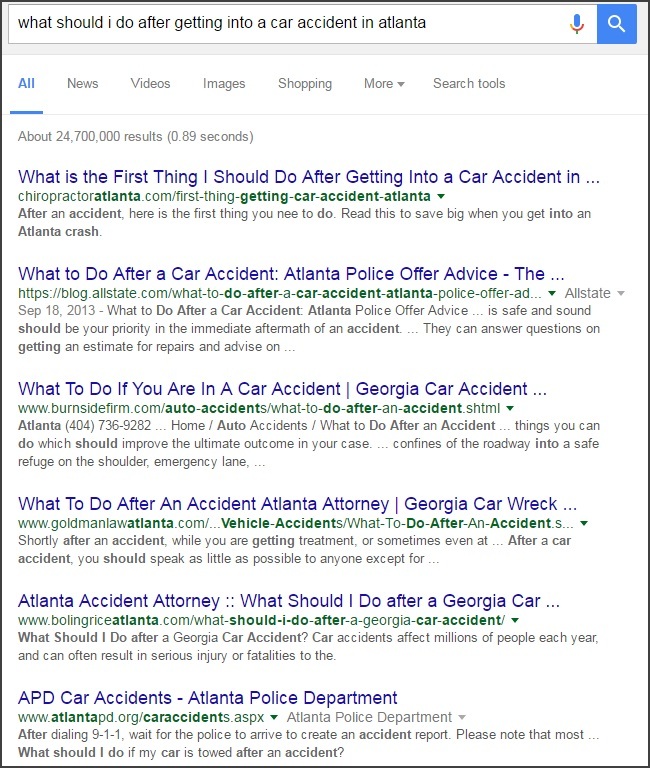 If someone is involved in some type of auto accident near Atlanta, it’s likely that their only means for searching online is through a mobile device. According to Google, approximately 20% of all mobile queries are voice searches. The fact of the matter is that this type of question is completely appropriate considering the circumstances. In fact, when searching with the phrase, “what should I do after getting into a car accident in Atlanta” you can see that the number one ranking is dedicated to a specific Chiropractic clinic. The phrase is relevant to an audience interested in locating medical support and is used by such consumers as proven by the fact that other government and professional medical systems also rank for this phrase, and their meta descriptions speak to this question. Don’t hesitate to develop content around long-tail keywords, questions and statements that show zero monthly search volume. Instead, perform a manual search of the questions or phrase that is of interest and see what type of content populates. If the competition or other relevant sources are speaking to this, then that means there are interested online consumers who are searching for this information. Many companies try to develop their own jargon or vocabulary for particular services in order to stand out from the competition, as well as to improve top of mind awareness for their target audience. However, this can lead to a number of issues from an SEO perspective, especially if such terms or phrases haven’t been vetted. Without mentioning names, there was one particular client that invented the term “Unglossary” as a way to reference their content marketing services. When they received their original keyword strategy, they couldn’t believe that this term wasn’t included and were quite upset. 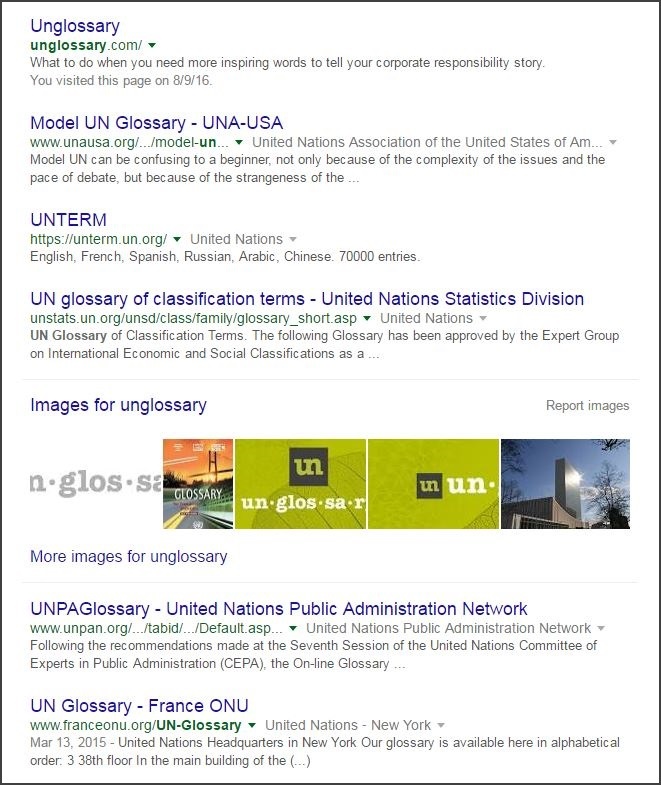 Their team of strategists had to show them that when “Unglossary” is searched for, the type of listings that appear predominantly skew towards information about the United Nations. Although they rank well for this term, it does not contain any monthly search volume, it is not in line with their competitors or their target audience’s intentions, nor does it lead to search results that are relevant for marketing. The value of any keyword strategy is completely dedicated to how well it considers the behavior and intentions of its intended target audience. Anyone can create a long list of keywords that reflects a particular company’s services and industry. Takes a significant amount of time and research in order to accomplish. For businesses and brands that are interested in maximizing their monthly traffic and conversions, make sure to avoid these common mistakes. What mistakes do you think strategists and marketers make when creating keyword strategies? What tools and advice do you have?